Born at St. Petersburg, April 29, 1818; assassinated there March 13, 1881. He succeeded his father, Nicholas I., March 2, 1855, before the end of the Crimean war, and when peace was concluded reforms of all kinds were initiated by him, the most important being the emancipation of the serfs in 1861. He also abolished capital punishment and the hereditary rights of the clergy, reorganized the administration of justice, gave an impetus to autonomy in various districts, cities, and provinces of the empire, abridged the term of military service, introduced some humane reforms into the army discipline, and enjoined universal conscription. Under his reign the press and public opinion developed to an extent previously unknown in Russia, by reason of the limitations placed upon the censorship; and every form of industry and commerce, art, science, and literature received a new impulse. Nicholas I. had tried in his own harsh, autocratic way to Russianize the Jews. Among other austere measures he introduced the cantonists' school for the military education of Jewish minors, who were forcibly torn from their parents. They had to pass through a rough discipline and were often compelled to join the Greek Orthodox Church. Aware of the mistakes his father had made in his despotic policy toward the Jews, Alexander endeavored to correct them, and early manifested a friendly disposition toward his Jewish subjects. He abolished the cantonists' school, admitted Jews to the high schools and universities, and by the laws of March 16, 1859, and of Nov. 27, 1861, he granted to Jewish scholars, university graduates, wholesale merchants, manufacturers, and (1865) artisans the privilege of settling, under certain conditions, outside of the Pale, in the interior provinces of Russia (Demidov San-Donato, "The Jewish Question in Russia," p. 36, St. Petersburg, 1883). 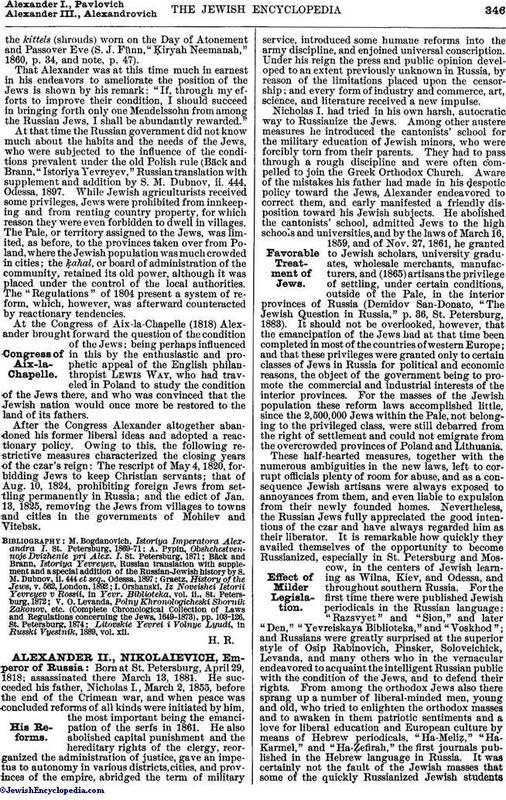 It should not be overlooked, however, that the emancipation of the Jews had at that time been completed in most of the countries of western Europe; and that these privileges were granted only to certain classes of Jews in Russia for political and economic reasons, the object of the government being to promote the commercial and industrial interests of the interior provinces. For the masses of the Jewish population these reform laws accomplished little, since the 2,500,000 Jews within the Pale, not belonging to the privileged class, were still debarred from the right of settlement and could not emigrate from the overcrowded provinces of Poland and Lithuania. These half-hearted measures, together with the numerous ambiguities in the new laws, left to corrupt officials plenty of room for abuse, and as a consequence Jewish artisans were always exposed to annoyances from them, and even liable to expulsion from their newly founded homes. Nevertheless, the Russian Jews fully appreciated the good intentions of the czar and have always regarded him as their liberator. It is remarkable how quickly they availed themselves of the opportunity to become Russianized, especially in St. Petersburg and Moscow, in the centers of Jewish learning as Wilna, Kiev, and Odessa, and throughout southern Russia. 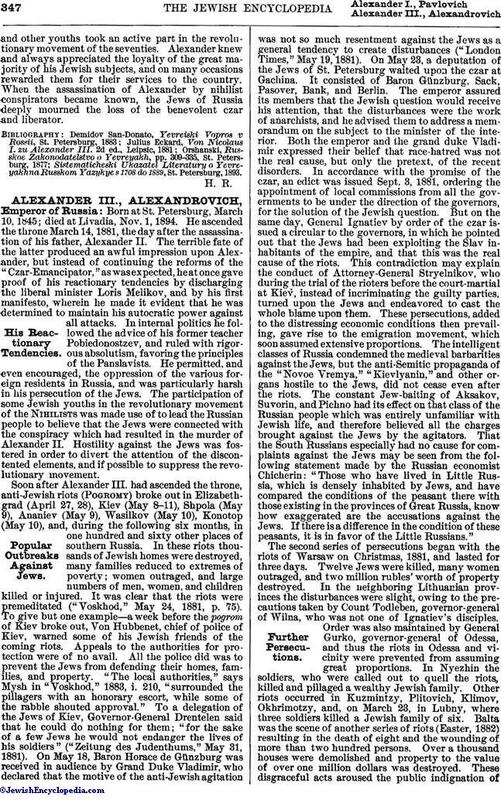 For the first time there were published Jewish periodicals in the Russian language: "Razsvyet" and "Sion," and later "Den," "Yevreiskaya Biblioteka," and "Voskhod"; and Russians were greatly surprised at the superior style of Osip Rabinovich, Pinsker, Soloveichick, Levanda, and many others who in the vernacular endeavored to acquaint the intelligent Russian public with the condition of the Jews, and to defend their rights. From among the orthodox Jews also there sprang up a number of liberal-minded men, young and old, who tried to enlighten the orthodox masses and to awaken in them patriotic sentiments and a love for liberal education and European culture by means of Hebrew periodicals, "Ha-Meliẓ," "Ha-Karmel," and "Ha-Ẓefirah," the first journals published in the Hebrew language in Russia. It was certainly not the fault of the Jewish masses that some of the quickly Russianized Jewish studentsand other youths took an active part in the revolutionary movement of the seventies. Alexander knew and always appreciated the loyalty of the great majority of his Jewish subjects, and on many occasions rewarded them for their services to the country. When the assassination of Alexander by nihilist conspirators became known, the Jews of Russia deeply mourned the loss of the benevolent czar and liberator. Sistematicheski Ukazatel Literatury o Yevreyakhna Russkom Yazykye s 1708 do 1889, St. Petersburg, 1893.